What Do Hazardous Waste Generators Value the Most in their Vendor? Managing hazardous waste disposal is a time-consuming and convoluted process for hazardous waste generators. From production to disposal, you’re responsible for every drop of hazardous waste that you produce from cradle to grave. In-house hazardous waste management would be a full-time job for a team of personnel, let alone a single manager who already has other obligations to fulfill. Laws and regulations change on a political whim and can vary greatly between local, state, and federal governments. If your hazardous waste disposal occurs across municipal or state boundaries, that adds even more legislative red tape for your manager to navigate. A single mistake can cost you a fortune in fines and penalties, along with the public relations nightmare that can accompany public exposure. One grievous error can shutter your business and leave you on the hook for millions in civil judgments. Handling something so important with so much potential for error, it is best to have a qualified, experienced hazardous waste disposal company take care of it. Most companies focus on cost and how quickly their waste can be picked up when they consider hiring a hazardous waste disposal vendor, but there are three other qualities that provide just as much value. As your business and products change, so too will your disposal needs. An unusually large or customized order can lead to the creation of hazardous waste in greater amounts than you’re used to. This could impact your hazardous waste generator status. It can also create different types of waste that your manager isn’t used to dealing with. If you’re lucky, your manager will have the time and foresight to learn all of the different legal requirements to accommodate these changes. If not, your company could find itself in violation of numerous local, state, and federal laws. A qualified hazardous waste disposal vendor deals with all manner of waste from a wide variety of industries. This gives them the expertise to scale their service to your changing needs. As your business changes, the vendor will be able to consult with you on any new or different requirements that now apply to you. Your manager may deal with hazardous waste, and all of the associated legalities, as a part of their job. For a hazardous waste vendor, that is their entire job, all day, every day. Like any business, the longer you do it, the better your knowledge, workflow and productivity become. 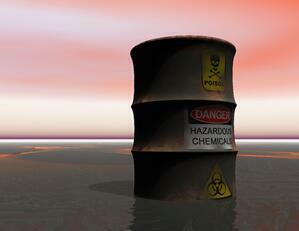 Hazardous waste disposal vendors have streamlined their operations through decades of experience. You could spend money to continually train your on-site manager, taking them away from other responsibilities. However, the hours you spend training them could still cost you if there is a major error or oversight. By spending money on a hazardous waste disposal vendor, you not only take advantage of their disposal experience, you also enjoy the protections of the legal expertise they’ve developed. This will reduce your upfront costs, free up your manager for other duties, and help protect you from future costs, fines and penalties. Unless you’re a hazardous waste disposal vendor, you probably want to spend your work hours focused on other business. The amount of time and cost it would take to learn what they already know is often better spent elsewhere in your business. And, like your responsibilities, it’s something that is best left to experts in those fields. Outsourcing your disposal needs to a certified vendor saves you money, and it can help free up time and manpower so you can focus on the success of your business. It’s a win-win proposition that will help your business and your peace of mind.